The series will run for three months. 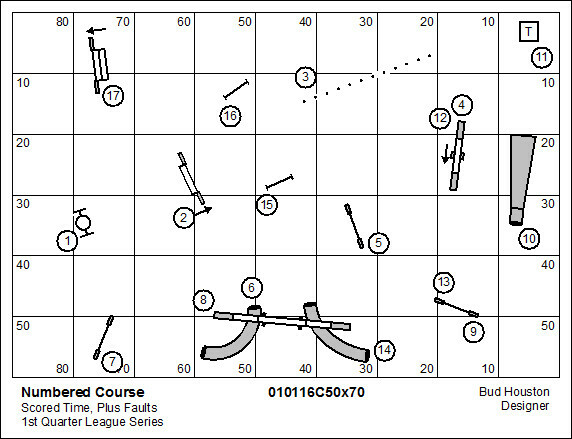 Below is a course map for each. 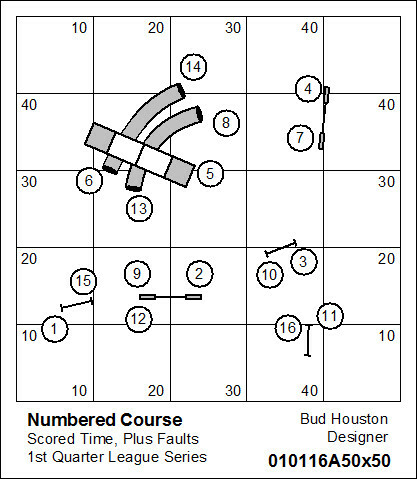 Each has a unique downloadable scorekeeping worksheet. This course is intended to allow the practice of “international” handling skills. The game is scored Time, Plus Faults. This course is intended to test handling skills somewhere between an intermediate level and masters level. The game is scored Time, Plus Faults. That is not to say that this league is reserved for Novice players. That’s not the idea at all. At the end of the day we wanted a league offering that didn’t make people’s heads hurt when walking the course… preferring instead, something logical and smooth. Three distinct league competitions shall be conducted each month, based on the size of the working space and by level of challenge. The 1st Quarter Series shall be:50×70 ~ Focusing on masters skillsFranchise clubs are free and encouraged to participate in all three of the ongoing leagues. 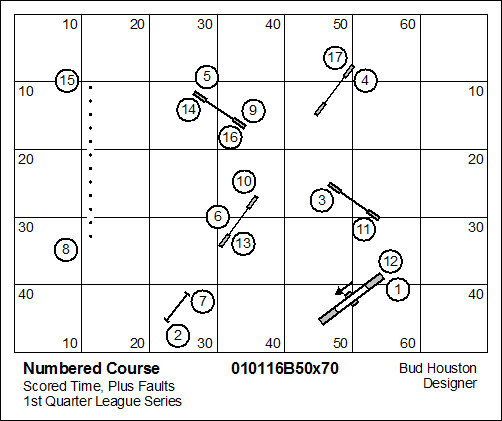 Numbered courses and games shall be scored according to Top Dog Agility rules for performance. Any game can be used so long as placements are clearly defined and the game can be played by all participants in a timely fashion (about one hour). For each of the three separate leagues team results and MVP (Most Valuable Puppy) statistics will be tracked by the League Secretary and reported back to the league membership at the termination of the league schedule. The League Secretary shall be responsible for maintaining a roster ofw teams, posting results of league competitions and accumulated scores in a timely fashion. The League Secretary shall be eligible to participate in competition with one or more dogs. Team scores will be determined by placement and LPP earned by the top scoring five dogs for each participating franchise. MVP scores will be determined by placement and total accumulated LPP. The team and dog with the highest accumulated points after eight weeks shall be determined the winner. Ties between two or more teams shall be resolved by standing in secondary and tertiary league competitions.Questions comments & impassioned speeches to Bud Houston Houston.Bud@gmail.com. The web store is up and running. www.dogagility.org/newstore. You’ll find in the web store The Book of Agility Games, an invaluable reference to clubs engaged in league play. This entry was posted on December 28, 2015 at 4:37 pm and is filed under National Dog Agility League, Numbered Course, Posting. You can follow any responses to this entry through the RSS 2.0 feed. You can leave a response, or trackback from your own site.